I had planned to add grass to our barren backyard and make it look as neat and presentable as possible until next spring. That's when I figured it would be the best time to have a professional landscaper come in since the extremely hot weather isn't the best for plants right now. Landscaping is not something I have succeeded at anyway...ever. It's just one of those things that's best left to the professionals in my household. But, I happened to notice a sign at Houston Garden Center advertising 70% off all plants and trees. I had to check it out even though I didn't really believe everything would be that cheap. It was! Actually, it still is because the sale is still going on. 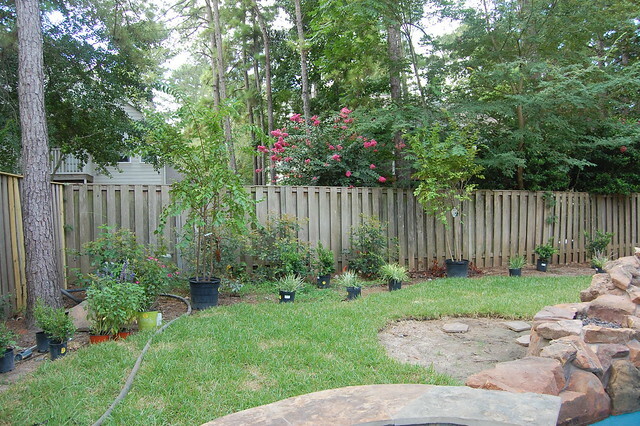 I bought Knockout Roses for $6, boxwoods for $2, wax myrtles for $5, and huge crepe myrtles for $36. 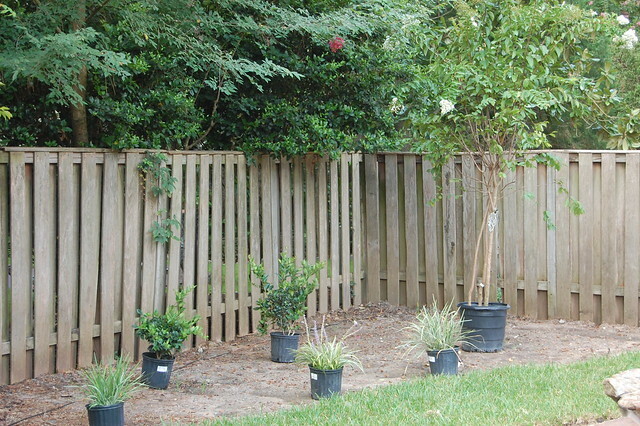 The crepe myrtles were $119 regularly. I did not completely believe the prices until I checked out at the register. We went twice on Saturday and back again on Sunday. I now have a full yard of plants for...drumroll please...$300! I've always love the way boxwoods look in front of roses bushes and now I have a place that's sunny enough to plant them. 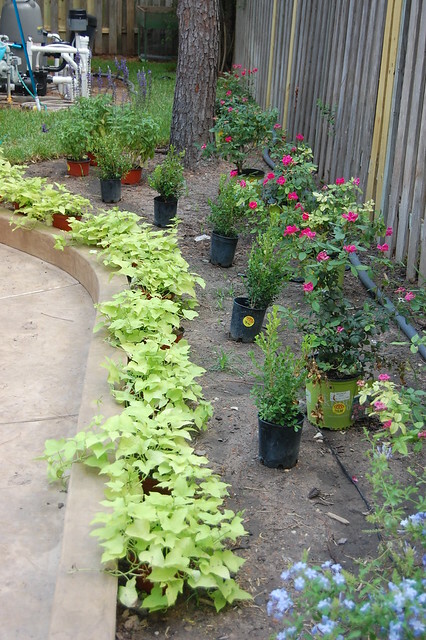 I also put a sweet potato vine in front of them to cascade over the small retaining wall. I initially wanted to break them up with other cascading plants, but I couldn't find anything I liked as well. I can always do that later or let a landscaper tweak it because these can be replanted somewhere else. Oh, and they were under $2 each! Since I have a black thumb, I'm going to let our yard guy plant these after he adds a bit of soil. Here's the view as you walk out the back door. This is so much better than looking at mud, lol. 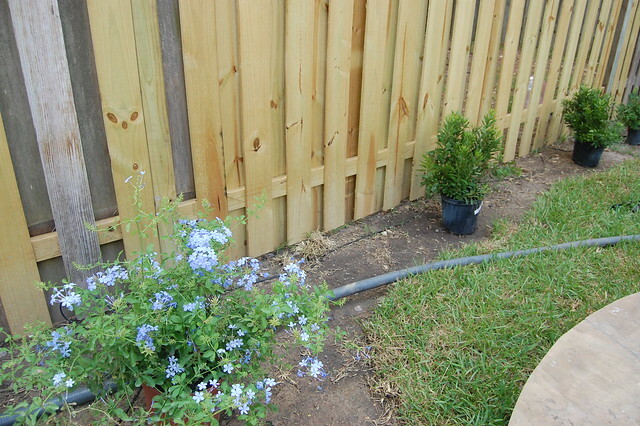 As you can see my husband has repaired the fence. We saved so much money doing it ourselves and it really didn't take much time. He worked on it for two days, but only spent a couple of hours each day on it since we had thunderstorms that weekend. My plan is to eventually have the fences completely covered up by plants. 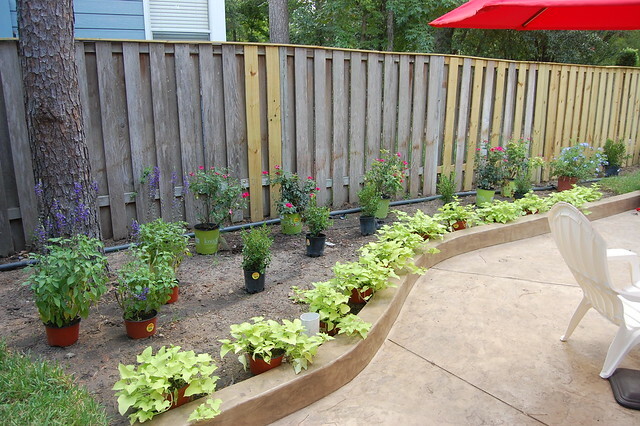 The roses aren't going to be quite tall enough so I would love to plant something that climbs on the fence. I love the idea of honeysuckle, but I'm not sure if I want to attract every bee in the neighborhood. Oh, and have you heard about the killer bee attacks lately? Terrifying! 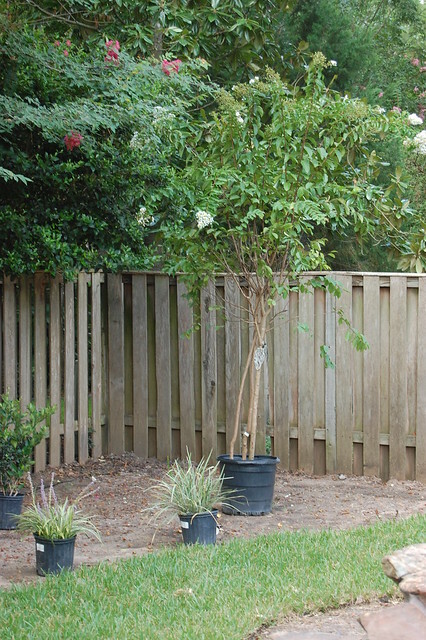 The other side of the fence might look a little wimpy in comparison, but these wax myrtles grow to be 12 feet tall. I love the privacy that these will give us. 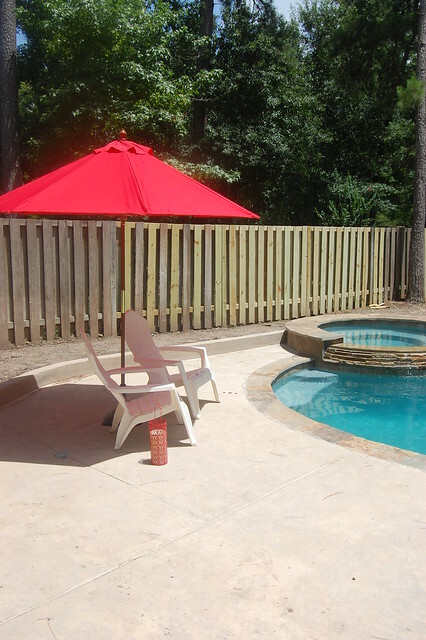 Another benefit is that it will hide the extreme slope next to the fence since they grow so large. According to the salesperson at the garden center, they will take about a year to get halfway up the fence. So, two years to cover the fence? Well, if I don't kill them by then they might get that tall. We have a couple on the other side of the fence, too. And the best deal ever! Can you believe this crepe myrtle was only $36? Look how tall that sucker is. It rivals my neighbors been-there-forever pink crepe. I decided on the white because I've heard people complain that the brighter flowers can stain concrete and pool plaster. Of course, I couldn't buy just one. I bought three for the back fence. 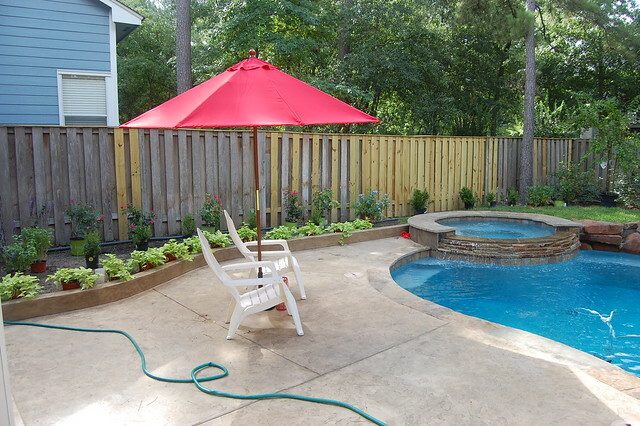 I'd also love to have them along the side fences, but the amount of flowers they drop that close to the pool changed my mind. 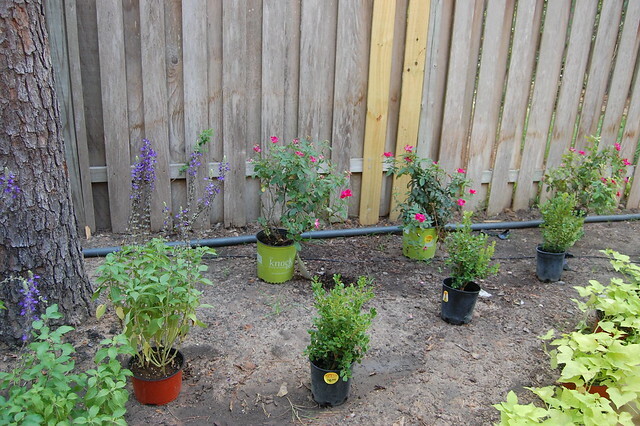 I bought a few filler shrubs, too. The dark green ones in the back get very large. It's also the same as our neighbor's shrubs that are peeking over the fence. I got my inspiration from what I see in my own neighborhood instead of gardens I love in pictures. The plants I've killed in the past probably weren't really meant to be planted in this climate and soil. I'm talking about you, hydrangeas! This corner of the yard is storing all of the plants we didn't have room for, but it will be the same as the other side because I'm not creative enough to go asymmetrical and make it look good. Do you see that huge hose lying on the ground? That's a temporary main electricity line. Yesterday, our power went out except for in two upstairs bedrooms. 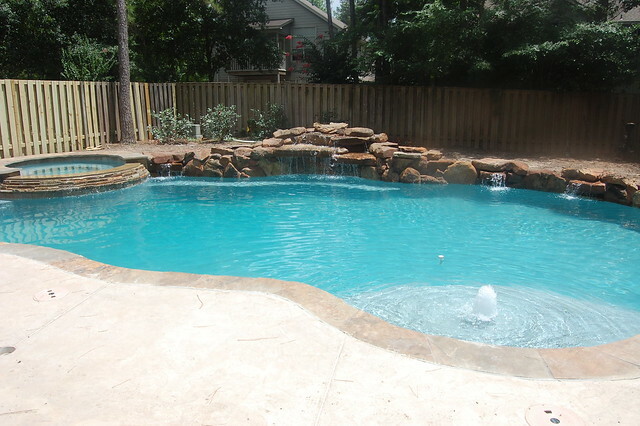 We called everyone-the pool guy, an electrician, and finally the electric company. Our first thought was that the breaker was overloaded, but we finally paid the emergency electrician fee to find out for sure last night. He immediately said the main underground line was not working. When we told him that the pool was only completed two weeks ago he said he was pretty sure it was nicked during the digging and they unsuccessfully tried to repair it. That doesn't surprise me since they cut our internet line and never said a word about it. Thankfully, our electric company is the only ones who fix this free of charge. If we lived 10 minutes south in a different county (and different provider) we would have had to pay $3000-4000 to have it fixed! I'm sure it would have been a mess because when we told our pool builder about it he immediately said it wasn't them. Okay...it's quite the coincidence the main line stops working a few weeks later. Anyway, the electrician was so nice and called our electric company for us to have someone come out last night. Despite the extremely high service fee, I can say it was well worth it to have air conditioning! Just to recap, remember what this yard looked like just a few weeks ago? What a difference! I might not be very good at landscaping, but it's a definite improvement. I can't wait to see the plants in the ground and the flowerbeds mulched. Mario is really loving having a backyard again. Keep on christening the yard instead of my rugs, boy! 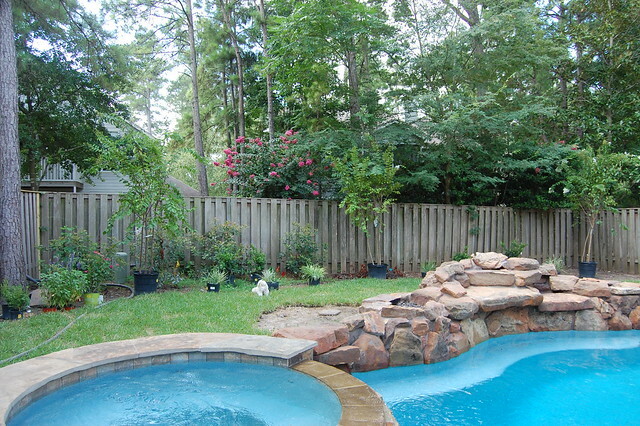 A before of the side yard. Can you believe all of these plants only cost $300? That's crazy! If you live in the Houston area, run to Houston Garden Center. I bet everyone is clearancing out plants right now though. It might not be the best time of year for planting, but it certainly is the best on your wallet! 70% off!!?? What a steal! And it is going to look AMAZING! That's looking awesome! I can't believe the amazing deals you got on those plants. I'm glad you got so many, it's looking nice already but in just a year when they fill in, it's going to look even better! Your electricity story scares me, so glad you live where you live and not 10 minutes further. That would be such a major headache and stress and then to have to pay thousands to have it fixed? Ouch. What a steal! It looks amazing, and they're not even in the ground yet! 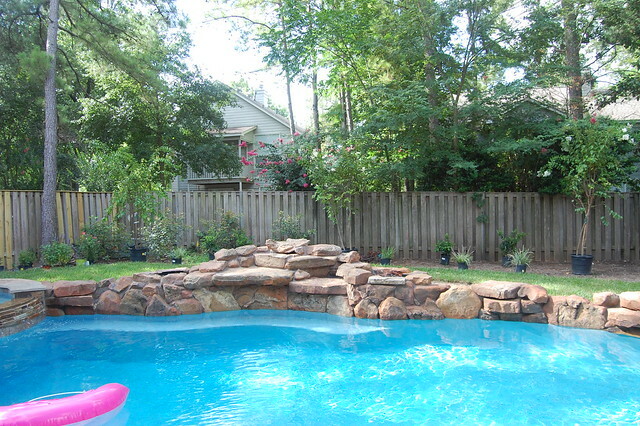 I'm dreaming of spending an afternoon in your backyard. 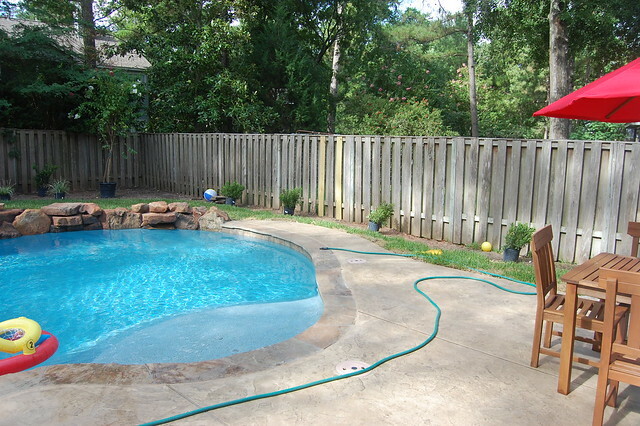 Love the pool and your new landscaping looks gorgeous. It will be so amazing when it fills in! 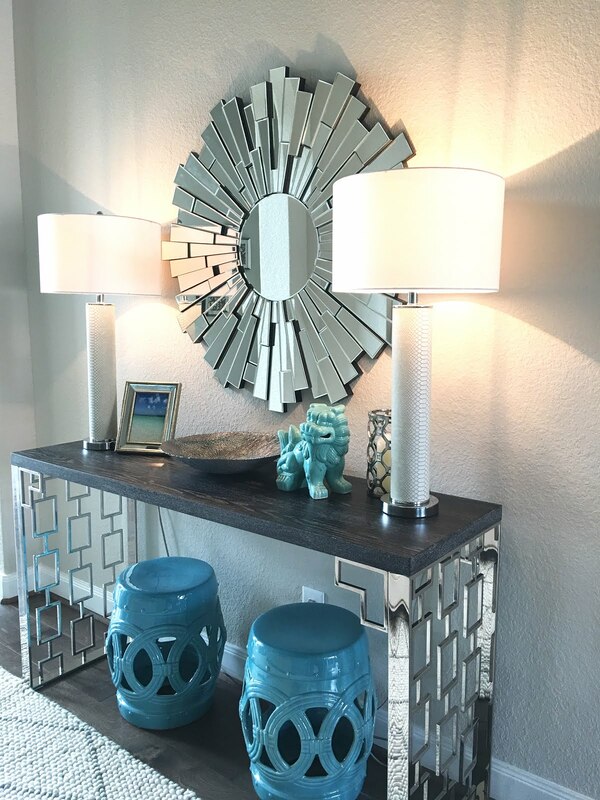 Wow...70% off...now that's a deal...its going to look beautiful!